We needed more office than the little alcove our studio provided, but didn't want to block windows with walls that jutted out into the larger studio space. We also needed more storage space. Our solution - an arch and cabinets that jut out into the larger space to define the office space while not blocking light with walls. We built and designed the cabinet drawers specifically to match our storage needs, with office supplies in smaller drawers on one side and equipment in deeper drawers on the other side. For the arch, we used a supporting ceiling arch from an old pioneer cabin we dismantled. The arch had been split for another use, but rejected because of the notches in it. We decided to piece it back together, leaving the notches and adze marks on it for character. The round logs we used as columns were originally from a 39-foot ridgepole that broke apart while we were moving it. We fastened the arch onto the studio walls and cabinets with long lag screws. 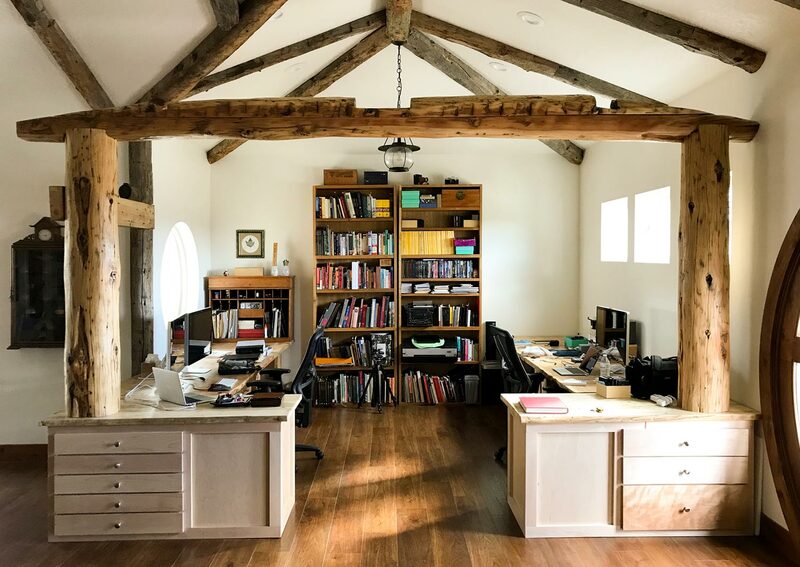 Donna Rouviere Anderson and Forrest Anderson are doing research for books on thoughtful home design and repurposing reclaimed timber.